is merely average. The pre-K results look pretty similar to me. The best programs get amazing results, but lots of programs are non-amazing in practice. First, I don’t believe that K-12 education is in a crisis. This doesn’t mean that I think we should listlessly accept the status quo. I’m very much in favor of more experimentation with charter schools, more research into effective teaching methods, and so forth. Nonetheless, there’s very little reason to think that K-12 education has been sliding into an abyss over the past few decades. 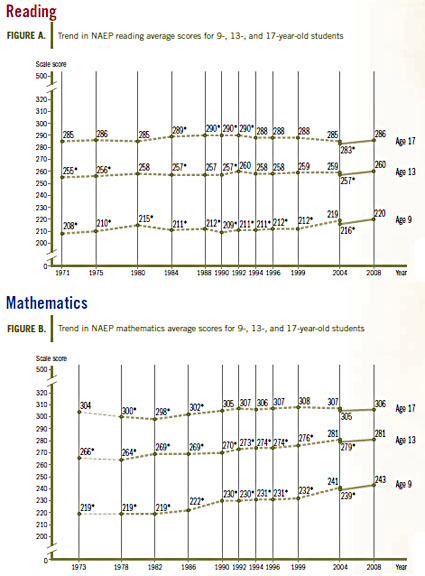 In fact, on the NAEP, the best regarded national test of math and reading, the evidence is pretty clear. No matter how you cherry pick the data, today’s kids are either doing substantially better than kids of the 70s or, at worst, doing about the same. I don’t actively favor reduced funding for K-12, but I don’t think it would be any kind of disaster either. Second, the problem with pre-K isn’t a scarcity of super high quality programs. It would be great to have those, of course, and we should work on getting there. But for now, our immediate problem is a scarcity of even mediocre pre-K programs. The evidence on pre-K doesn’t suggest to me that small children need exceptional programs, it suggests that they need something more than sitting around watching The Lion King all day. That’s where we need to focus our attention. Too many poor and working class kids get virtually no pre-K care at all, and there’s now a ton of research showing that this is permanently devastating to cognitive development. Simply putting them into decent programs would have a huge effect. $500 billion per year on K-12 education and $50 billion per year on pre-K.
$400 billion per year on K-12 education and $150 billion per year on pre-K. I would choose Door #2 without any hesitation. By the time they finished high school, kids in the second system would almost certainly be better off on average — better educated and better prepared for life, with fewer behavioral problems, fewer drug problems, and fewer teen pregnancies — than the kids in the first system.